The iOS 7 brings a major overhaul to the user interface - it has brand-new flat look, transparent menus and keyboard, new system icons and apps, new control center and much more. Before we continue here is a quick video demonstration of the new iOS 7 running on the iPhone 5c. iOS 7 looks a lot different to its predecessor, but its logic of operation is mostly the same. All of your apps are on the homescreen, folders are available and there is the familiar dock that can take up to four shortcuts. All system icons are different though, the clock now has an animated icon showing the current time, the system fonts have been altered, there are lots of semi-transparent elements and new gestures. Let's start from the beginning - the lockscreen. It's totally different and yet it works in a very similar way. 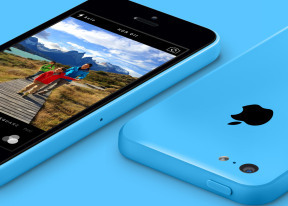 The slide to unlock bar is now gone and you can swipe anywhere on the screen to unlock your iPhone 5c. The text is somewhat illogically placed right above the tiny arrow for the control center which points up, but you actually still need to slide to the right to access the homescreen. The swipe could've worked both ways, left too, but that's not the case. The lockscreen also has the camera shortcut at the bottom, you can swipe up from there for quick access to the camera app. A double press of the Home key will bring the multimedia controls as usual. Lockscreen notifications are available as well. You can notice two transparent arrows at the top and the bottom of the lockscreen. Swiping from the top will display Notifications, while swiping from the bottom will bring up the new Control Center. Swiping the lockscreen out of the way reveals the revamped homescreen. The Spotlight pane is now gone - but not lost. It's just triggered by a new pull-down gesture anywhere on the homescreen. Folders are available as usual, but there is no limit any more on how many apps you can put inside them. Pages are available in the folders, each page can pack up to nine apps and there is no limit on the page count. And you can finally put the Newsstand app away in a folder! Hallelujah! The opening and closing of folders is now accompanied by a cool animation. Those do take a bit too long, though, and might become irritating once you are past their wow phase. A cool bit is the folder icons and the folders themselves are semi-transparent and their backgrounds adapt to the background's prevailing color. You should have already noticed the semi-transparent dock, folders, keyboard and Control Center in the screenshots. The Notification and Control Center colors are also adaptive, just like the folders, and they'll change depending on the background. So they might be blue-ish on the homescreen, but light gray in the web browser, or dark gray in the settings, or green in the gallery, etc. The keyboard is less transparent and has only two themes - very light gray and very dark gray. Of course, they also change depending on whether your keyboard has popped up on top of a light or a dark background. Beside the new theme and font, the iOS keyboard is unchanged, which is not a bad thing as it's certainly one of the most comfortable around. Dictation is also available courtesy of Siri. Just hit the dictation button on the left of the space bar and fire away. Keep in mind that the performance may suffer in noisy environments. The changes don't end with those transparent and adaptive visuals. Opening an app involves a zoom in animation over the app icon, which is pretty cool. The parallax effect is observable throughout iOS 7. Apple designed the new iOS on independent layers - background, homescreen icons, icon badges, app pop-ups. The iPhone then uses its accelerometer and gyroscope to move layers independently and create an illusion of depth. The movement is very subtle. In fact, you might not even notice it if you are not looking for it, but it's there and it looks awesome once you start moving your device. The parallax effect is not only available on the homescreen. You can see it in folders and in the pop ups that ask you for passwords or display notifications. Those pop ups by the way are also translucent and adapt their background color. In case you don't like the parallax effect you can turn it off from the Accessibility entry in the Settings menu. Apple iOS 7 brings live wallpapers. You can find them in the relevant section of the Wallpaper Settings. Currently there are seven live wallpapers and unfortunately there is no wallpaper section available in the App Store. It seems we'll have to rely on Apple for adding more of those with further iOS updates, which is less than ideal. You might have noticed in all those shots that Apple has ditched the cellular coverage bars and replaced them with five dots. The battery also got a new icon. Apple decided not to follow the competition and put the connectivity toggles in the notification area. They're in a brand new Control Center instead, that's pulled up with a swipe from the bottom of the screen. It has five non-customizable rows for various shortcuts. The top row has five toggles - Airplane, Wi-Fi, Bluetooth, DND mode and Rotation Lock. The second row has the brightness slider. Next come the media player controls including a volume bar. The fourth row has AirDrop and AirPlay shortcuts. Finally, at the bottom of the Control Center there are four shortcuts - one that turns on/off the LED flash to serve as a flashlight and three app shortcuts - Clock, Calculator and Camera. The volume slider is perhaps a bit redundant but nothing in the Control Center is customizable. It's a great, and well overdue, addition. The Notification Center has been redesigned as well. It now has three tabs - Today, All and Missed. The Today tab has the date, a summary of all events for the day, calendar day view, reminders, stocks and tomorrow's summary. As usual, you can choose which apps you want to show up in the pull-down Notifications and in what order. The Today's tab is customizable, you can disable its elements one by one - everything but the date displayed at the top can be removed so it doesn't get in the way. You can even disable the Today tab altogether in the Notification Center for the lockscreen. The All tab is basically the notification center of iOS 6 but sans the weather, stocks and calendar events. The first two are now part of the Today tab, while the weather is gone for good. You can disable the All tab for the lockscreen as well (just turn off Notifications View). If both Notifications (All) and Today tabs are disabled, the entire Notification Center won't be available on the lockscreen. The Missed tab displays new emails, messages and missed calls, while your iPhone 5c was locked. Those notifications are still available in the All tab. Other than that, the handling of notifications hasn't changed a bit. You can opt to disable a notification, set it to be a banner, which will shortly pop up over the status bar or an alert showing up at the center of the screen. As before, you can interact with notifications straight on the lockscreen. If a notification has just arrived, sliding to unlock will open up the relevant app - upon a missed call, you'll go straight to the phone app. You can also swipe a notification to perform a task - swipe to call back or text.